The Kron & Card LLP website and the information contained therein is solely for informational purposes and so that you may familiarize yourself with the legal services we provide, our practice areas, our background and experience, and our contact information. Use of this website and the communication of information by, in, to, or through this website does not create an attorney-client relationship, nor does it constitute legal advice or substitute for a professional legal consultation. You should not act upon or rely on any information contained in this website without first seeking qualified professional counsel regarding your specific matter. By use of this website to communicate with the attorneys or other associates of Kron & Card LLP, you acknowledge that any transmission of information by way of e-mail does not create an attorney-client relationship, nor should any such communication be considered to be privileged or treated as such Kron & Card LLP. For the protection, please do not send any confidential or sensitive information to Kron & Card LLP unless and until you have previously communicated with an attorney at Kron & Card LLP and have received authorization to transmit such information. Kron & Card LLP’s attorneys are generally only licensed to practice law in the State of California, and the information offered by and through this website has been prepared by such attorneys. Accordingly, you should not act or rely on any information given by this website without first seeking advice from counsel licensed to practice in your particular jurisdiction and qualified to handle your particular matter. Unless it is expressly stated otherwise, the attorneys featured on this website are not certified as specialists or experts by any professional or governmental agency or authority. Designation of Kron & Card LLP’s practice areas, concentrations, types of experience, and interests as reflected in the attorneys’ biographies and within the website’s contents is not intended to convey any particular formal certification or specialization. The Kron & Card LLP website is not intended as advertising or solicitation in any jurisdiction where this website would be characterized as such and would fail to comply with the applicable laws and ethics rules of that jurisdiction. The Kron & Card LLP website may either directly or indirectly provide links to the websites or webpages of other parties for the convenience of those who use this website. Kron & Card LLP does not control, maintain, or claim responsibility for any or the materials presented by other persons or parties in the websites or webpages to which the Kron & Card LLP website may link. The inclusion of a link on the Kron & Card LLP website does not in any way imply or constitute affiliation, association, or relationship between Kron & Card LLP and the sponsor of the link, nor does it constitute endorsement, approval, support, or sponsorship by Kron & Card LLP. Similarly, Kron & Card LLP does not represent that the sponsor of any websites or webpages to which this site links endorses, approves, supports, or sponsors Kron & Card LLP, nor is such sponsor necessarily affiliated, associated, or related to Kron & Card LLP. Use of these links will navigate you away from the Kron & Card LLP website. Further, you agree that you shall not, without prior written consent of Kron & Card LLP, link any material or content on our site to the website or other publication of yourself or another. The Kron & Card LLP website may provide links to downloadable and fillable forms for the convenience of those who prepare their own legal documents. To the extent The Kron & Card LLP website provides links to downloadable and fillable forms, Kron & Card LLP only provides those links and downloads to individuals for self-help at your specific direction. The information presented on the Kron & Card LLP website is provided “as is” and without representation or warranty of any kind, either express or implied, as to suitability, reliability, applicability, merchantability, outcome, result, fitness for a particular purpose, or non-infringement of third-party rights. 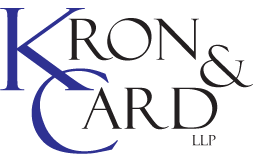 Kron &Card LLP does not represent or warrant that the information presented on this website is or will always be up-to-date, comprehensive, complete, or accurate. Laws are constantly changing and each jurisdiction has different rules and regulations which may differently govern the specific facts and circumstances relating to your legal matter. Accordingly, do not rely on any information contained within this website without first consulting counsel who is competent to deal with your particular legal matter in your jurisdiction. Kron & Card LLP is not responsible for any loss, injury, claim, liability, or damage related to your use of this site, your use of any downloadable or fillable form, or your use of any site linked to this website, whether from errors or omissions in the content of our site or any other linked source, from the site being down or from any other use of the site. In short, your use of the site is at your own risk. By use of this website, you agree that Kron & Card LLP is not liable to you or others, in any way, for any damages of any kind or under any legal theory arising from your use of this website or your access to or reliance upon the information therein. By visiting and/or using the Kron & Card LLP website, you understand that Kron & Card LLP may collect general information about the way in which you use our website. Such general information may include the time and duration of your visit, the type of web browser you use, your IP address and operating system or platform, the starting point of your navigation to the website, the source from which you linked to the website, and your CPU speed. This information will generally be used to identify levels of interest in our website and our business and to optimize our website for improved visibility and increased exposure. Should you choose to provide us with your personal information either by email or by use of a form on the Kron & Card LLP website, please be advised that we may collect that information to contact you or to transmit information to you. We will never sell your information to a third party. While we employ security measures to protect the limited personal information which may be disclosed to us through the Kron & Card LLP website, we do not guarantee that the security precautions that we have taken will protect against, and we therefore expressly disclaim any liability for, any loss, misuse, or alteration of your information. The Kron & Card LLP website may employ “cookie” technology to track your use of our site. If you prefer that your computer not accept our website’s cookie, you may generally opt to decline cookies by modifying the settings on your web browser. If you have provided us with your contact or other information by or through the Kron & Card LLP website, you may contact us at administrator@www.kronandcard.com if you decide that you no longer desire to be contacted or if you wish to correct any inaccurate information you have given. All materials, including but not limited to written materials, images, illustrations, icons, symbols, logos, designs, photographs, videos, software, slogans, and any and all other materials which are featured on the Kron & Card LLP website or any other Kron & Card LLP website or webpage are protected by copyright laws and are intellectual property owned and controlled by Kron & Card LLP. Kron & Card LLP hereby authorizes the downloading and viewing of material on this website solely for the personal, temporary, and non-commercial use. No part of any of the materials featured on the Kron & Card LLP website may be copied, reproduced, uploaded, posted, republished, transmitted, stored, or distributed in any form or by any means without the prior written permission from Kron & Card LLP. The firm name Kron & Card LLP, along with any and all logos or symbols appearing on this website, any other Kron & Card LLP-affiliated website, webpage, or other publication, are trademarks of Kron & Card LLP.